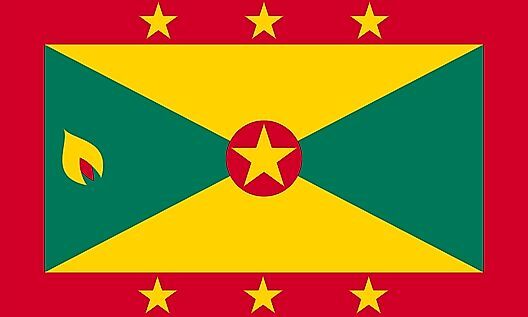 The country of Grenada consists of the main island of Grenada, the larger islands of Carriacou and Petit Martinique, and some 600 small islets, most uninhabited. The islands of the country of Grenada are all volcanic in origin and vary in elevation from 300 m (984 ft), to over 600 m (1,968 ft). The island of Grenada itself is more mountainous than the others and covered by dense forest. Its land rises from a narrow, coastal plain into areas of dormant volcanic ridges and valleys. Mount St. Catherine is the highest point rising to 840 m (2,760 ft). The island is drained by many small rivers flowing to the sea, all cutting deeply into the slopes. A few of the mountains contain crater basins, and one includes a large crater lake named Grand Etang. The lake is over 1700 feet above sea level, and is surrounded with some of the island's most beautiful rainforest. Waterfalls are scattered across the upper-reaches of Grenada, as well as a few boiling springs; the River Sallee boiling springs is the most significant.